We just wrapped up an enlightening week at the Cremation Association of North America Convention (CANA 2018) in Fort Lauderdale where 150 of the top cremation professionals gathered to share stories and learn new business strategies in an intimate environment. The week was filled with profound stories about cremation told by industry leaders and we’ve selected 4 of our favorite quotes from the week that blew our minds. Share your favorite quotes with your friends on Facebook! At first glance, this quote seems brash and crude – but Baldwin was simply making an obvious point that is often overlooked. This quote was taken from his presentation at CANA 2018 and it was a response to an audience question about how he decides where to put crematories. His point was that you can use logic to figure out the best places for a cremation business – just like a candy bar company would want to be in an elementary school vending machine, crematories should be placed in communities with a dense elderly population – it’s basic business. 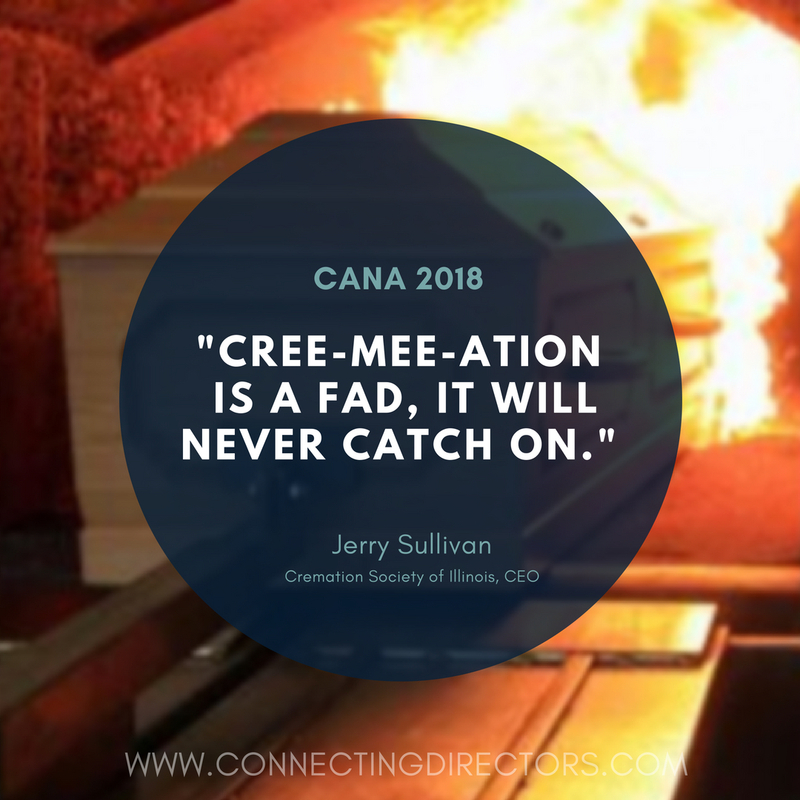 The presentation by Rick Baldwin and John McQueen was one of the highlights of the CANA 2018 in which the duo opened up candidly about the strategies behind their massively successful cremation businesses to a room of 150 captivated funeral professionals. With all of the new challenges, rituals, and questions that cremation has brought to the industry over the last 100 years, it is easy to over-think and lose sight of the essence of why we cremate. 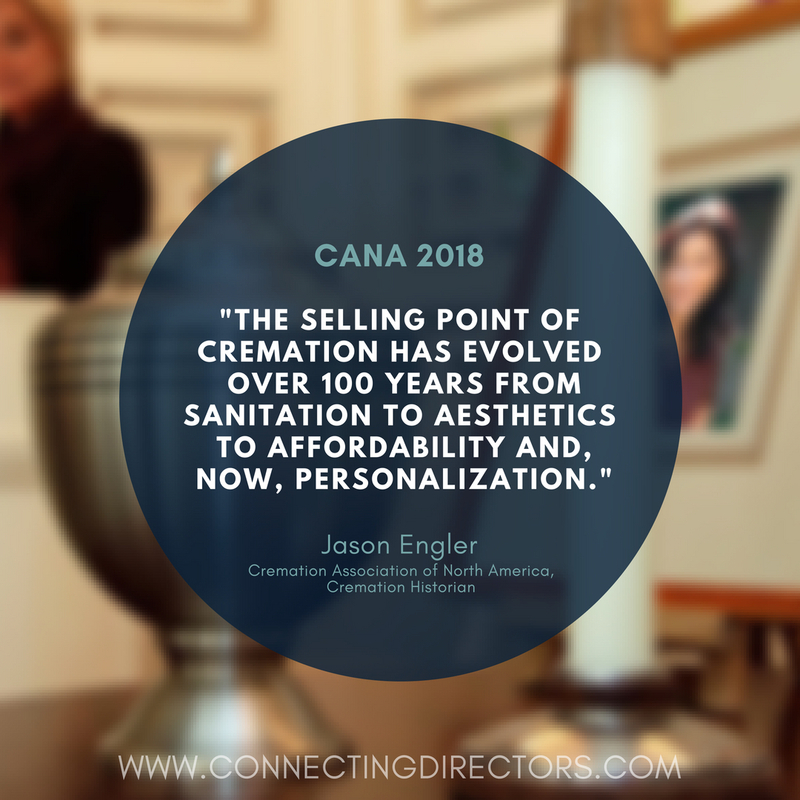 Justin Baxley, Director of Strategic Markets at Homesteaders Life Company, made this comment during one of the many enlighting intimate conversations that took place at CANA 2018. It is a clear reminder of the fundamental reason that cremation exists. Just like every other product and service, we offer a solution to a problem – death just happens to be a universal one. 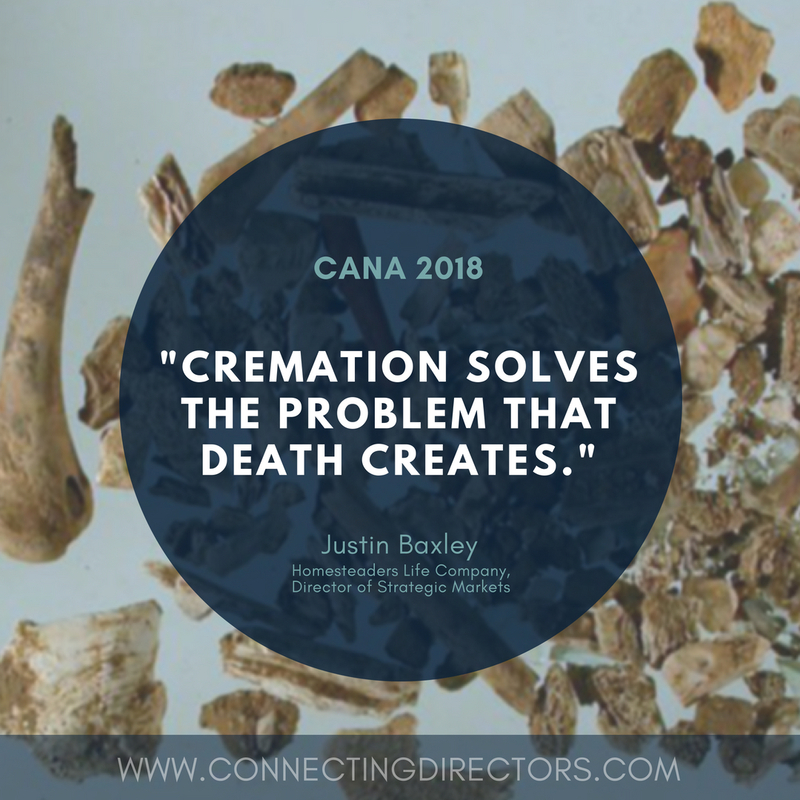 One of the most compelling presentations at CANA 2018 was a talk by cremation historian Jason Engler about the history and evolution of cremation in the United States. One of the biggest topics among funeral professionals today is how to sell and profit from cremation as it continues to rise in popularity. It’s easy to forget that in its more than 100-year history in the United States, the primary selling point for customers has dramatically evolved over time. His words paint a fascinating history of how we’ve arrived at an age when we cremate more people than we bury. Which quote is your favorite? Share it on Facebook!